Fred Gets Ready to Blow. Image from his website. 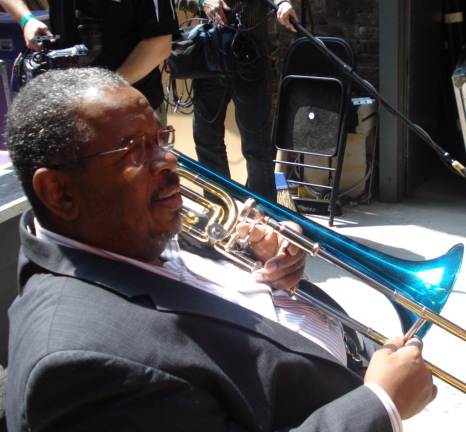 Fred Wesley is best known as the former trombonist, composer, and musical director for James Brown during one of Brown’s most fertile periods, 1968 – 1975. He then arranged and played for Parliament – Funkadelic and Bootsy’s Rubber Band before joining the Count Basie Orchestra for a time. Now he leads his own band, the New JBs, and is a key player in Abraham, Inc., a klezmer-funk band. He also guests on numerous recordings, teaches, and has written a biography entitled “Hit Me, Fred: Recollections of a Sideman.” We had a short phone conversation on September 24, 2011, a couple of days before his appearance in the Twin Cities with a band celebrating the music of Lionel Hampton. LE: How did you get into music? What did you do before you got into the James Brown band? FW: Oh, well, I was just a road musician. I played with Ike & Tina Turner, Hank Ballard & the Midnighters (see also the R&G interview). I was in the Army, and had my own band for a while, and then I joined James Brown. LE: That was obviously a career-turning moment for you. Had you decided to be a full-time professional musician before then? FW: I always intended to be a musician. I led my own band, and it broke up. The army broke up my band. They kept drafting my musicians and sending them to Viet Nam. So I had to find a job. The James Brown gig came along and I took it. It was supposed to be temporary, but it turned out to be a long time. LE: What impact did that have on you as a musician? FW: Well, as a musician I played some new music. James Brown was an innovative musician and he got us to play some things I hadn’t played before. With Ike & Tina Turner and Hank Ballard & the Midnigters it was a different kind of R&B. I found it interesting. We disagreed on certain points and I left him. I left him in 1970. I came back in ’71 with my mind made up that I would do whatever he said and try to figure out what he was doing. LE: Once you finally left James Brown, you played with the Parliament-Funkadelic group and then joined the Count Basie Orchestra. Had jazz been something that interested you all along? FW: Oh yeah, yeah, I was planning to be a jazz musician. The band I had before I joined James, we played a lot of jazz. It was supposed to be a jazz band, with a little funk thrown in, you know, but James Brown changed all of that. When I joined Count Basie’s band, it was an opportunity for me to play with a great musician, so I played with Count Basie as long as I could. LE: That was an entirely different kind of approach to music. Did you have to adjust, or was it an easy change for you? FW: It was hard for me to go back to playing jazz. I had played some jazz in a big band in the army, but it had been some time, and was quite a challenge for me. For a long time I had the longest hair in the band, I wore boots and stuff, because I was coming straight out of Bootsy’s band. LE: How did the opportunity for this current show come about, the show celebrating Lionel Hampton? FW: Jason Franklin is a friend of mine and he offered me an opportunity to play with some great musicians, Diane Schuur, Jason Marsalis, and Red Holloway. I really jumped at the opportunity to play with these musicians. LE: What is it you’re discovering about the music of Lionel Hampton and your own playing in this context? FW: Lionel Hampton was a great vibes player, which I’ve known for a while, but Jason Marsalis is mimicking him very well. He can play very well too. Red Holloway is a great musician, it’s just a pleasure to be able to play with these musicians. LE: We look forward to seeing you Monday and Tuesday night at the Dakota. FW: All right. Thank you. Bye bye. This entry was posted on Monday, November 7th, 2011 at 2:24 pm and is filed under Interviews. You can follow any responses to this entry through the RSS 2.0 feed. You can leave a response, or trackback from your own site.